The Kaua‘i Island Utility Cooperative (KIUC) entered a plea agreement today in federal court in Honolulu to resolve violations of the Endangered Species Act (ESA) and Migratory Bird Treaty Act (MBTA), the U.S. Department of Justice announced today. KIUC pleaded guilty to count one and count 16 of a 19-count indictment returned by a federal grand jury in May 2010. Count one charged a violation of the ESA by knowingly “taking” at least 14 Newell’s shearwaters, a federally protected threatened species, at or near Keālia Beach. Count 16 charged a violation of the MBTA by the “taking” of at least 18 Newell’s shearwaters, also protected as a migratory species, at KIUC’s Port Allen facility. In accordance with the terms of the plea agreement, KIUC was sentenced to the maximum statutory fine of $40,000 for the two counts to which KIUC pleaded guilty and a period of probation of 18 months with specific conditions intended to avoid additional violations during the period of probation. In addition, KIUC agreed to modify and reconfigure power lines associated with the highest incidences of take. KIUC must also monitor two stretches of inland power lines to help determine the number of protected birds colliding with those lines. KIUC is also required to apply for an incidental take permit that would authorize, as required by law, the taking of such threatened species under certain conditions and requirements. And the plea agreement also required that, as community service, KIUC make a payment of $225,000 to an account, established at the National Fish and Wildlife Foundation, to benefit protected seabirds on Kaua‘i. The plea agreement stated that this requirement was aimed at repairing the loss to Kaua‘i of these culturally and ecologically important seabirds, while recognizing KIUC’s annual funding of the program since 2003. The Newell’s shearwater (known in the Hawaiian language as ‘a‘o) is a seabird native to the Hawaiian Islands. The majority of the world’s population of Newell’s shearwaters nests on the island of Kaua‘i, specifically in burrows on inland mountains. Adult Newell’s shearwaters fly between the ocean and these nesting areas from spring through fall of each year. Young shearwaters leave these inland mountain nests and make their first flight to the sea from September to December each year, typically at night. The young birds use mountain air currents or physical drop offs to become airborne. If a young shearwater falls to the ground in a location without conditions such as those that occur in the inland mountains or at sea, it usually will be unable to regain flight. The species is identified as endangered on the International Union for Conservation of Nature (IUCN) red list. In its plea agreement, KIUC admitted that it knew Newell’s shearwaters could collide with its power lines and that such collisions could kill and otherwise harm the birds. A scientific report completed and made public in 1995 recommended actions to reduce the take of seabirds by utility lines, including modifying the configuration and locations of power lines. According to the indictment, KIUC did not undertake any of the recommended line modification/reconfiguration actions except for a limited stretch of power line near Keālia Beach after being notified in March 2007 that it was a target of a federal investigation. 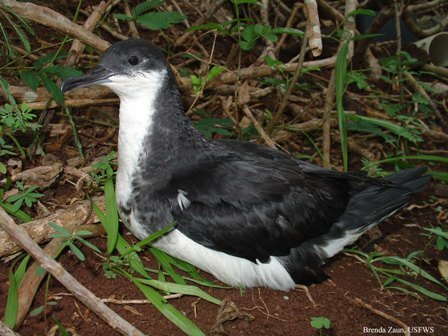 KIUC admitted in its plea agreement that since June 2005, at least 14 Newell’s shearwaters were found dead near KIUC power lines near Keālia Beach and Donkey Beach. At least ten more shearwaters were found since 2005 near other KIUC power lines, including lines in and near the Wailua River Valley, Waimea River Valley, ‘Ele‘ele, and Kapa‘a. Necropsies of some birds concluded that they died from blunt force trauma consistent with a collision with a power line or other solid object. Eyewitnesses have observed such collisions with KIUC power lines. KIUC further admitted it knew that young shearwaters are attracted to lights and this attraction may cause the birds to collide into power lines or fall to the ground from exhaustion due to circling the lights. KIUC acknowledged it knew that modifying or shielding lights so they shine only downward significantly reduced the light attractions and related harm to the birds. KIUC admitted that although it shielded streetlights in 2003, after being required to do so in an agreement with the U.S. Fish and Wildlife Service, it failed to shield its lights at the Port Allen facility. KIUC acknowledged that nine Newell’s shearwaters were found on the ground at or near the Port Allen facility in an eight-day period in October 2006. The Endangered Species Act prohibits the unauthorized taking, including harming and harassing, of species listed as threatened or endangered. The Migratory Bird Treaty Act prohibits the unauthorized “taking”, including wounding or killing, of bird species listed as migratory. Assistant Attorney General Moreno credited Special Agents from the U.S. Fish and Wildlife Service for the investigation of the case culminating in the Indictment and subsequent plea agreement. The case is being prosecuted by the Environmental Crime Section, Environment and Natural Resources Division, U.S. Department of Justice.